About 50 years ago, the first ant farms took off in popular culture, turning children into backyard scientists. Now, a team of scientists has shown that the invention of agriculture — by ants — happened some 50 million years ago. "Ant farmers" used the world’s first pest-control management in the form of antibiotics. “Less than a century ago, humans learned to employ antibiotics for medicinal purposes, whereas ants have been using antibiotic secretions from bacteria to manage their fungus gardens for millions of years,” said Christian Rabeling, an assistant professor in the School of Life Sciences within Arizona State University’s College of Liberal Arts and Sciences. The study appears in the journal Proceedings of the National Academy of Sciences and was a result of a collaboration between ASU, the University of Wisconsin-Madison, Smithsonian Institution, Harvard Medical School and the University of Sao Paulo. The story begins in the New World, where 60 million years ago, a new group of ants, the fungus-growing or attine ants, emerged from the tropical rainforests of South America. Attine ants love mushrooms, making them their sole crop to cultivate and care for. But like humans, ant farmers faced the threat of pests in the form of fungal parasites that could wipe out their harvests. So, not long afterwards, the ants began marching in step with a symbiotic bacterium, called actinobacteria, that grows in clumps of stringy white patches on the ants’ exoskeletons in special, deep pockets. These pockets, known as crypts, could provide a home for the actinobacteria while the ants could use their antibiotics to spread on and protect their rich mushroom crops. A fungus-farming ant trapped in amber from the Dominican Republic shows bubbles on the underside of its body that are likely from bacteria that produce antibiotics capable of keeping a garden parasite at bay. A queen ant imaged under an electron microscope is covered in black dots, each of which is a pocket capable of housing and supporting symbiotic bacteria. Christian Rabeling is an assistant professor in the School of Life Sciences within ASU’s College of Liberal Arts and Sciences. Postdoctoral researcher Jeffrey Sosa-Calvo shows off some of the ASU ant collection, gathered from field collections in far-flung Central and South American locations. Today, actinobacteria are the leading source of antibiotics in medicine, but 50 million years ago, ants figured out that by letting bacteria live on their bodies, they could protect their crops. Using new DNA data from a special ASU and Smithsonian collection of 69 ant species, the scientists traced back in time and found that the relationship was so important, it evolved three separate times in fungus-farming attine ant species. Ant species who aren’t farmers lack these structures. 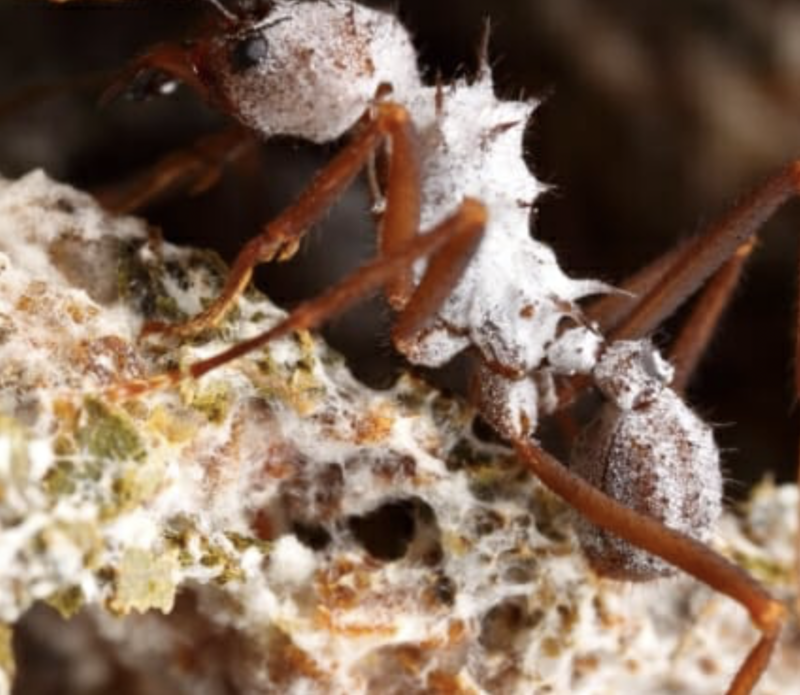 “This work provides fascinating insights into an animal using bacteria to provide antibiotics over a long period of time,” said Cameron Currie, a UW-Madison professor of bacteriology who has researched the dynamics of farming ants for decades. Further evidence for the ancient origin of the ant-bacteria relationship came from a handful of fungus-farming ants fortuitously frozen in amber from what is now the Dominican Republic. Through the hardened tree sap, the researchers could spot the telltale signs of bacteria clinging to the ants’ bodies. With the amber dated to between 15 million and 20 million years old, the research team could validate their genomic data and show that the ant-bacteria symbiosis was at least as old as the amber samples. Some 10,000 years ago, humans first mimicked the ants’ farming lifestyle. Later, in the 20th century, people turned to actinobacteria for most clinical antibiotics. That the ants have, for millions of years, used similar antibiotics to protect their fungal gardens from pests suggests that we still might learn from their success. Perhaps the ants may know best how to use their precious antibiotics to prevent the rise of antibiotic resistance — which has never occurred in ant colonies. “I strongly believe there are mechanisms here that reduce the emergence of antibiotic resistance,” Currie said. Word-of-mouth reviews can have powerful effect, ASU marketing study finds. Some days it feels like everything happens in the world of social media, but an Arizona State University professor has new research on how face-to-face conversations affect our opinions about products and services. It turns out that many consumers are pretty positive. “If we share opinions on a product or a service, it probably won’t shape our overall opinion after we have a conversation. But if we have conflicting opinions, we were curious about what happens. How do you weigh that?” said Adriana Samper, an associate professor of marketing in the W. P. Carey School of Business, who worked on the project with Daniel Brannon. Brannon received his MBA and PhD at ASU and is now an assistant professor of marketing at Northern Colorado University. So they tested their theory across four studies measuring people’s views of a product or restaurant visit when they encounter the same or a differing opinion. “The main finding was that you have this funny positivity effect,” Samper said. “If I have a good experience and you have a bad experience, I don’t factor your opinion into my likelihood of being satisfied or visiting the restaurant again. The study, titled “Maybe I Just Got (Un)lucky: One-on-One Conversations and the Malleability of Negative and Positive Consumer Judgments in the Face of a Contrasting Experience,” is published in the Journal of Consumer Research. The first study, done in the W. P. Carey Behavioral Research Lab, was complex. “The study design had to make the interaction seem like a natural conversation between two acquaintances, but we still had to have everything controlled in the lab,” Samper said. It worked this way: Study participants filled out a personal information sheet with a pen. Half of the pens were damaged, so they didn’t work. After completing several studies in the lab, the participants were asked to give feedback on the lab equipment, including workstations, study materials and the pen. Then, the participants thought they were proceeding to a new study about conversation styles. They interacted with a “confederate,” an actor posing as another participant. “The premise was that they discussed being business majors, with the hope that they would develop a rapport,” Samper said. As they were leaving, the confederate casually asked, “Did you have to rate the pen?” And then they discuss whether the pen worked. There were four conditions: Both had pens that worked, both had pens that didn’t work, the participant’s pen worked and the confederate’s pen didn’t and vice versa. “What we found was that if they got the bad pen and the confederate said, ‘Mine worked fine,’ they would adjust their perceptions upward and be more likely to be satisfied with it and use the product again or make a purchase,” Samper said. If the participant’s pen worked and the confederate’s didn’t, it didn’t change the evaluation. Samper said they purposely chose an inexpensive item like the pen to prove that the effect was not limited to more expensive products such as smartphones or laptops. The second study also was a “likeable stranger” study done in the lab, only regarding services such as dining. The third study was an online survey in which participants imagined conversations with their best friends about products and services. The researchers also wanted to measure expectations, so in the fourth study they manipulated expectations by having the participants read an online restaurant review, then imagine going there and having either a good or bad experience and then discussing it with a friend. Reading a good review first boosted the effect of discounting one’s own bad experience, they found. “Because they had such positive expectations, when they had a bad experience and the acquaintance had a positive experience, we found a really big boost,” she said. They were able to reverse the effect by having the participants read a bad review of the restaurant. “If I expect the place to be bad, and then I have a good experience, and my friend had a bad experience, then I’m like ‘OK, maybe my experience wasn’t that good. Maybe I just got lucky.’ That’s where the title came from,” she said. The marketing takeaway for companies is to not just focus on bad online reviews, but also to encourage good word-of-mouth reviews because interpersonal communication is persuasive. “These conversations appear to be surprisingly common and powerful, as consumers in an increasingly homogenized retail landscape often use the same products and services, and share these experiences with one another,” the paper said.